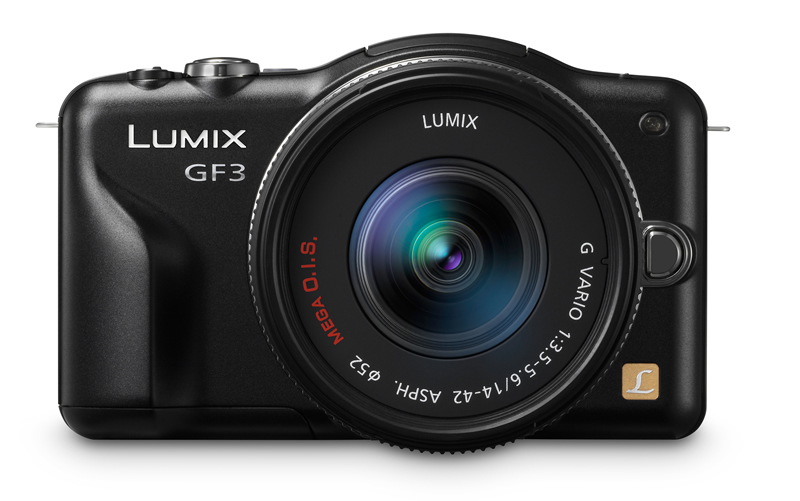 Panasonic today announced the Panasonic LUMIX DMC-GF3X, which is essentially a DMC-GF3 plus an "X" and an all new retractable power zoom lens; the LUMIX G X VARIO PZ 14-42mm (F3.5-5.6). Billed as the company's smallest and lightest compact camera with a retractable, interchangeable lens, the GF3X carries over all of the goodies from the GF3, including a 12.1 megapixel MOS image sensor, a 3.0-inch touchscreen LCD, and 1080i HD video recording. The star of this "new model" is that new lens. With its 35mm equivalency of 28-84mm, it features POWER O.I.S. (optical image stabilization) and when combined with the GF3X, the Lightspeed AF (auto focus) can focus and snap a shot in a tenth of a second. The new lens, along with all LUMIX "X" lenses features Panasonic's proprietary Nano Surface Coating, which purports to help "minimize ghosts and flaring in natural settings"
Panasonic's LUMIX GF3X body + lens kits will be available this October (2011) in black or silver with an MSRP of $749.99. But the LUMIX G X VARIO PZ lens (14-42mm/F3.5-5.6) will also be available separately for $399.99 because it has been designed to work with all LUMIX G-series cameras (no firmware update needed).